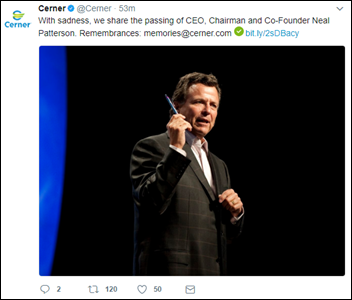 Neal Patterson, co-founder, CEO, and chairman of Cerner, died Sunday of complications following a reoccurrence of cancer. He was 67. The company announced that co-founder and vice board chair Cliff Illig will serve as chairman and interim CEO. Cerner says its CEO selection process is nearly complete.